Motorcycling reminds us of simpler times - that classic period of decades past where it was all about the open-road, a rider, and their bike. Some of us like to keep it simple, but simple doesn’t have to mean boring or unrefined. A minor refinement to a classic design allows us to maintain our heritage while keeping with the times. 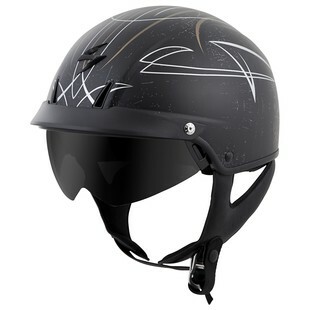 Case in point, the new Scorpion EXO-C111 Pinstripe helmet: Here’s a lid that utilizes the tried-and-true half-helmet design, while raising the bar of your average cruiser helmet to something that can keep up with the 21st century. We’re talking a retractable tinted sun-visor, anti-microbial liner, an aerodynamic ventilation system, and even snap-in pockets for the speakers required of modern Bluetooth communication systems. What gives the Pinstripe its name is the Von Dutch-inspired pinstriping graphic scheme that adorns the shell. Tastefully done, the pinstriping really nails a custom look, and like the helmet, I think it embodies that classic style that harkens back to the heyday of Hot Rods and Choppers. If you’re looking to “get with the times”, but still keep it old school, the EXO-C110 is a great choice.